A new paper by F.R. Stephenson, L.V. Morrison and C.Y. Hohenkerk, "Measurement of the Earth's rotation: 720 BC to AD 2015" in Proceedings of the Royal Society A, December 2016, Volume 472, Issue 2196 presents new determinations of Earth Rotation (ΔT). Today, ΔT is the difference between Terrestrial Time (TT) and Universal Time (UT1) i.e. ΔT = TT − UT1. It is a measure of the difference between a time scale based on the rotation of the Earth (UT1) and an idealised uniform timescale at the surface of the Earth (TT). TT is currently realised from TAI, International Atomic Time, where TT = TAI &plus; 32.184 seconds. Before atomic time, Ephemeris Time (ET) was used as the uniform timescale based on Newcombe's Tables of the Sun. In order to predict the circumstances of an event on the surface of the Earth, such as the circumstances of a solar eclipse, a prediction of ΔT must be made for the instant of observation. Abstract: New compilations of records of ancient and medieval eclipses in the period 720 BC to AD 1600, and of lunar occultations of stars in AD 1600–2015 are analysed to investigate variations in the Earth's rate of rotation. It is found that the rate of rotation departs from uniformity, such that the change in the length of the mean solar day (lod) increases at an average rate of &plus;1.8 milliseconds per century. This is significantly less than the rate predicted on the basis of tidal friction, which is &plus;2.3 milliseconds per century. Besides this linear change in the lod, there are fluctuations about this trend on time scales of decades to centuries. A power spectral density analysis of fluctuations in the range 2–30 years follows a power law with exponent −1.3, and there is evidence of increased power at a period of 6 years. There is some indication of an oscillation in the lod with a period of roughly 1500 years. Our measurements of the Earth's rotation for the period 720 BC to AD 2015 set firm boundaries for future work on post-glacial rebound and core–mantle coupling which are invoked to explain the departures from tidal friction. 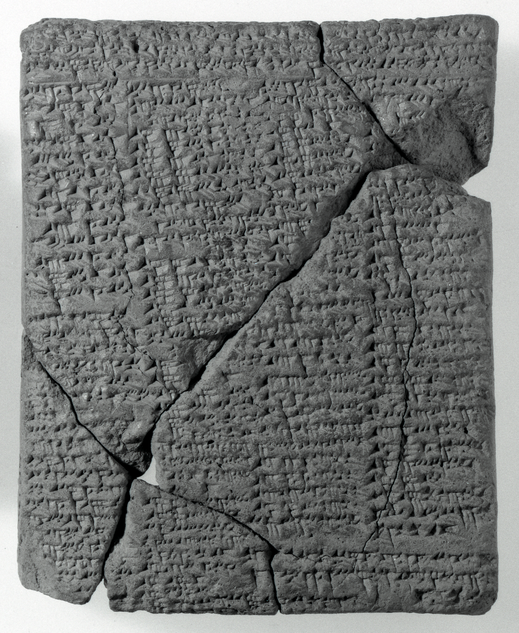 The image of a clay tablet written in cuneiform script contains an accurate account of the occurrence of a total solar eclipse witnessed at Babylon in 136 BC. The narrowness of the belt of totality crossing Babylon fixes the rotational phase of the Earth at that epoch. This, and other extant records of eclipses — both solar and lunar — from ancient Babylon, China, Greece, the Arab Dominions and medieval Europe, are used to trace the history of the Earth's rotation over the past two and a half millennia. The paper can be downloaded from the DOI web site as it has been published as an Open Access article. Annual values of ΔT and length of day (lod) using the results from the 2016 paper are available. This paper has been updated and the revised results from the Journées 2017 paper are also available. FAQ's on the rotation of the Earth are available to download.